Seattle, Washington: Sam Garriott Antonacci, 2013. Edition of 5. 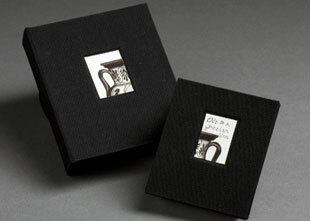 Miniature book: 2.125 x 2.125" closed, 11 x 3.8" open. Single sheet folded extending from pastedowns of paper covered boards. Epson print of prismacolor and ink on parchment. Signed and numbered on backboard with handwritten colophon information. Hand illustration on front board. 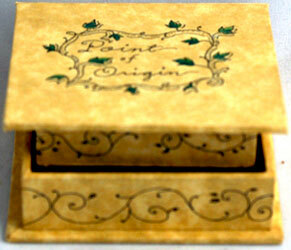 Housed in a 3 x 3 x 1" clamshell box with illustrations on cover and title handprinted on spine. Laid in box with Antonacci's printed label on lid and printed specifics of book tipped in. 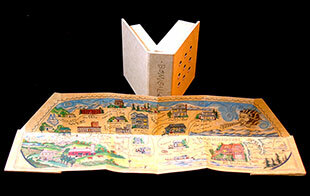 Sam Garriott Antonacci: "Domicilia II is a map book of all the places that I have lived. It is a small document of personal history - once you open it up, it can be folded accordion-style in order to stand up for display." Seattle, Washington: Sam Garriott Antonacci, 2011. One-of-a-Kind. 3.5 x 4.625 x 1.375"; 6 pages. Accordion with giclée prints on Arches Black. 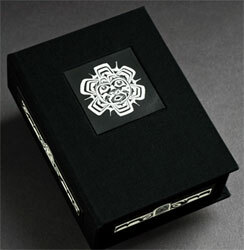 Book laid in custom box decorated with original pen and ink drawings inset on four sides. Sam Garriott Antonacci: "North Coast Spirits is a portrait book of my art mentors and lifelong friends here in the Pacific Northwest. One of my first jobs here was working as a scrimshaw artist, and my art education really began there. My co-workers taught me a mixture of technique, perspective, art history, and the mythology of the Native American tribes of the Pacific Northwest. Each of the drawings is representative of some quality of these mentors." Seattle: Sam Garriott Antonacci, 2006. Edition of 5. 2.75 x 2.87"; 10 pages. 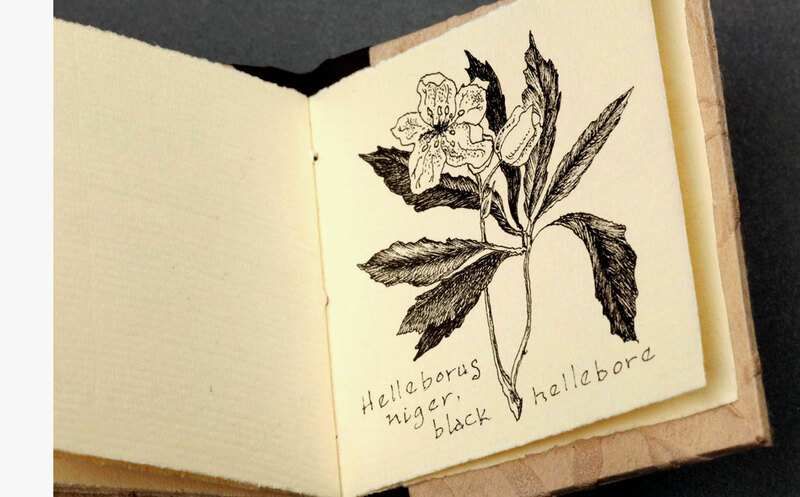 Casebound book with pen-and-ink botanical drawings printed on Frankfurt Zerkall paper. 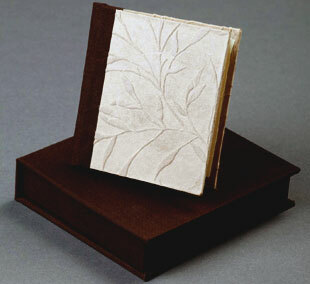 Bound in Japanese paper covered boards with brown cloth spine. Housed in brown cloth box (3.5" x 3.87 x 1"), which fits into a brown mesh bag with pull closure. Five pen-and-ink drawings by Antonacci: Caparis spinesa (caper plant); Papaver somniferum (poppy); anemone hortensis (garden anemone); Adonis vernalis (bird's eye); Helleborus niger (black hellebora). Seattle: Sam Garriott Antonacci, 2009. Edition of 5. 5.5 x 5.25 x .75" bound in black and beige cloths. Illustrated paper title tipped on lid. Digitally printed (Epson printer) on matte paper. Prismacolor and ink. Front pastedown pocket for 2 loose leaves (3.75 x 4.25"). Back pastedown shadow box. A whimsical take on an entomologist's collection box of beetles. 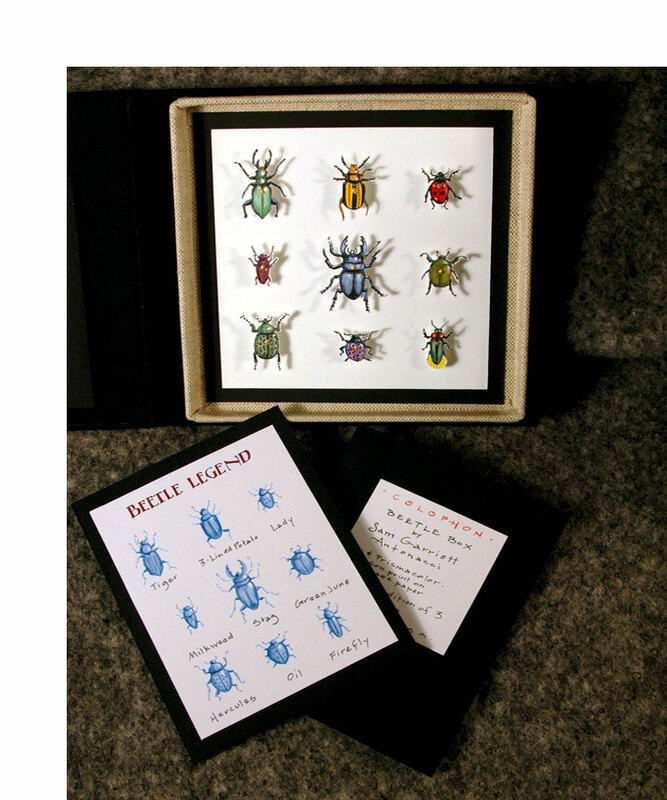 Nine beetles individually cut and mounted in the shadow box. A Beetle Legend provides each specimen's common name and a Beatle Legend identifies each specimen with a name from a Beatle's song (Mr. Kite, Michelle, Lovely Rita, etc.). Seattle: Sam Garriott Antonacci, 2007. Edition of 10. 3 x 2.5" closed, 17.5" extended; 6 paged accordion fold book. Giclée prints of graphite and pen-and-ink drawings. 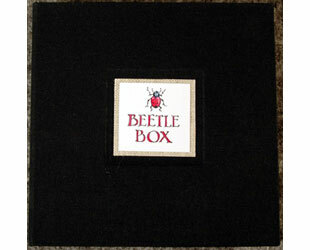 Bound in black bookcloth with illustrated paper title on front cover. 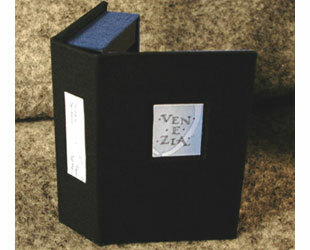 Housed in black cloth-covered box with colophon tipped in bottom and paper illustration on lid. 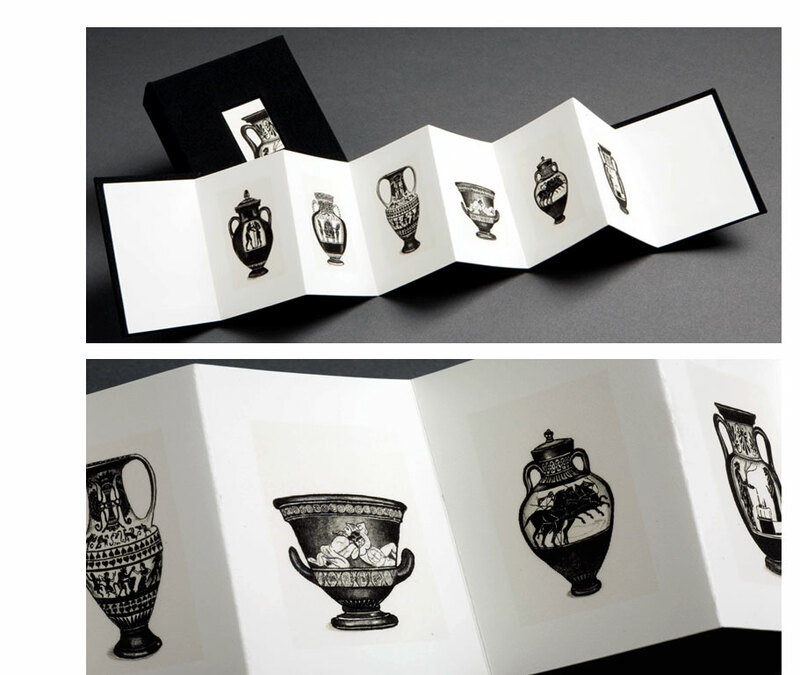 Grecian urns of different shapes and sizes dance across the pages of this miniature accordion book. Seattle, Washington: Sam Garriott Antonacci, 1999. One-of-a-Kind. 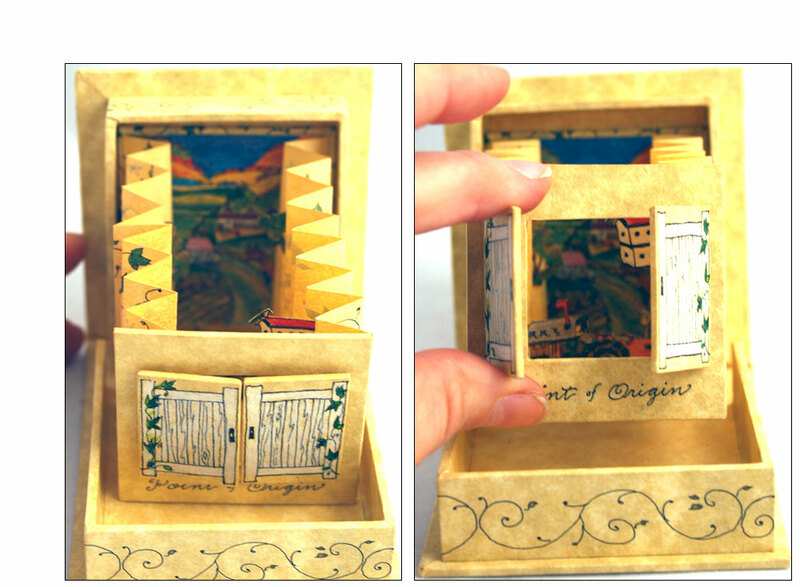 2.875 x 3 x .875" miniature tunnel book built into a clamshell box. Title on front in ink. Prismacolor and ink on parchment paper. Sam Garriott Antonacci: "I see many of my books as histories or small personal documents of people, places, or objects. 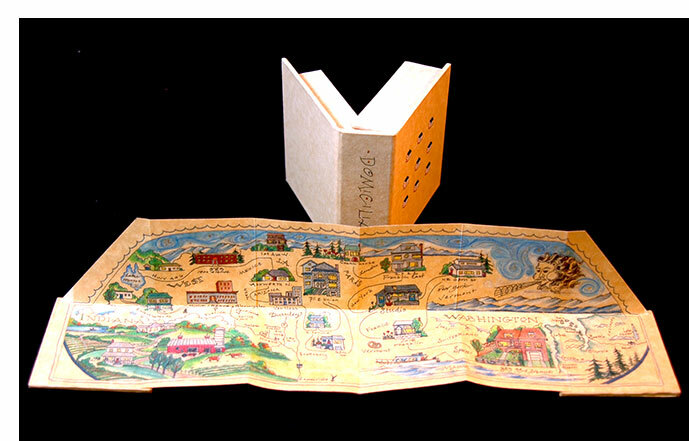 Point of Origin is a visual telling in a tiny tunnel book form of my family's farm in the Ohio River valley where I spent my childhood and youth. This farm has been in my family for seven generations, and the book references things that were important in that rural life: plants, a mailbox and tractor, and all the autumn colors that I miss now that I live in the Pacific Northwest." 2.875 x 3.875 x 1.25" with pop-up and book. Digitally printed (Epson printer) on Thai Unryu paper. Front pastedown pulls down to form pop-up. A miniature book (2 x 2" closed; 6.25 x 4.75" open) - is housed snugly in an interior compartment on the rear board of the clamshell box. Bound in clamshell box of blue and black cloths. Other materials: prismacolor & acrylic. Paper title inset on lid. 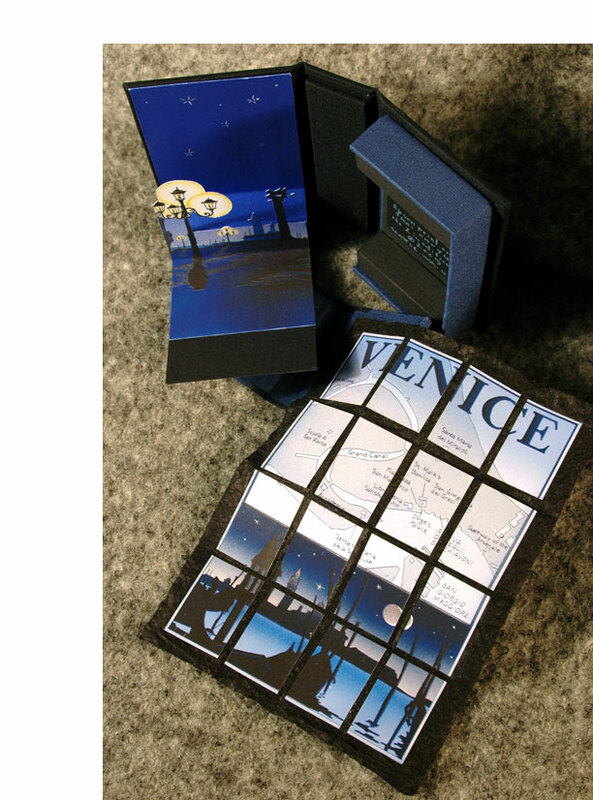 A homage to Venice - a pop-up reveals a night scene on the Grand Canal, the miniature book unfolds to a checkerboard rendering of the Grand Canal area. The night-sky blue and black colors lend a dreamy tone.